Murray hugs the trophy after becoming the first British man to win multiple Wimbledon singles titles since Fred Perry in 1935. Andy Murray said his second Wimbledon title made him happier than his 2013 All England Club triumph and insisted Sunday's win over Milos Raonic was for him to savour. Murray defeated Canada's Raonic 6-4, 7-6 (7/3), 7-6 (7/2) to win his third Grand Slam crown and become the first British man to lift multiple Wimbledon titles since Fred Perry in the 1930s. The 29-year-old, who became Britain's first male Wimbledon singles champion for 77 years in 2013, is the 12th man to enjoy more than one All England Club triumph. Murray had sobbed in frustration after losing to Roger Federer in his first Wimbledon final in 2012, but four years later the tears were purely joyous. "I feel happier this time, more content. I feel like this was sort of more for myself more than anything, and my team as well," said Murray. "The last time it was just pure relief, and I didn't really enjoy the moment as much, whereas I'm going to make sure I enjoy this one more than the others." He added: "I obviously want to win to make all the fans that come to watch happy. I'm not suggesting this was only for me. "But the last time it was such a big thing, you know, for a British man to win Wimbledon. It had been so long, I was so relieved that I'd done that." After the tension of his first Wimbledon final victory against Novak Djokovic in 2013, this was a much more serene affair as Murray cruised to the title with an almost flawless display. He praised Raonic, who was playing in his first Grand Slam final and had knocked out seven-time champion Roger Federer in the semi-finals. "Milos has had a great few weeks on the grass and had some unbelievable wins, that semi-final against Roger (Federer) was a great match," said the world number two. Murray has won all 12 of his matches since recently reuniting with coach Ivan Lendl, who was also in charge of the Scot's backroom team when he last won Wimbledon. But Murray aimed a cheeky dig at the notoriously taciturn Czech, who barely flashed a smile despite his player's victory. "He's just lucky," Murray smiled. "A big thank you to all of my team for all the hard work they've put in to help me. "To all my family watching up there, I love all of you." Murray also defused an awkward situation when he referenced the presence in the Royal Box of British prime minister David Cameron, drawing jeers from sections of the crowd. "Huge thank you to everyone who came out to support. The Prime Minister of the country is here. "Playing at a Wimbledon final is tough and I certainly wouldn't want to be Prime Minister, it's a tough job," he said before disappearing into the plush corridors of Centre Court to be greeted by well-wishers including Prince William and Hollywood actor Benedict Cumberbatch. Raonic admitted the bitter taste of defeat in his first Grand Slam final would linger for a while after he failed to become the first Canadian to win a major title. "It's a difficult challenge. 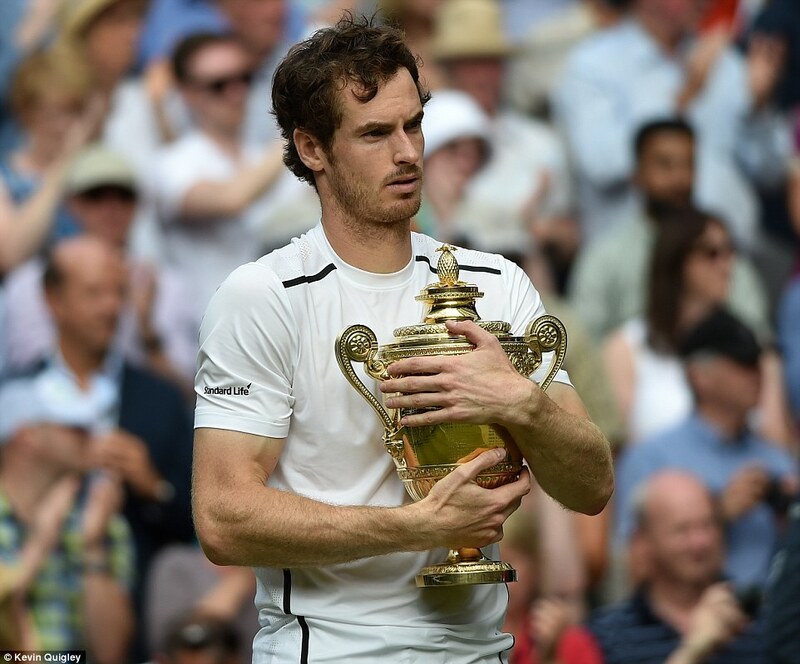 Andy has been playing great and he deserved to win, congratulations to him," he said. "This one is going to sting. I'm going to make sure I do everything I can to be back here for another chance. "It's been a phenomenal two weeks. I keep plugging away. Every single day I try to get better to give myself chances to get to these finals."